Recent worldwide increases in the abundance of some jellyfish have been associated with human-caused disturbances to the environment such as eutrophication, overfishing and climate warming. Moon jellyfish (Aurelia aurita). Photo by Hans Hillewaert, courtesy of USGS. The term jellyfish is taxonomically broad, referring to gelatinous plankton in the phyla Ctenophora (comb jellies) and Cnidaria (all other jellyfish). While jellyfish have been components of pristine marine ecosystems for millennia, recent worldwide increases in the abundance of some jellyfish have been associated with anthropogenic perturbations such as eutrophication (Arai 2001), overfishing (Lynam et al. 2006), climate warming (Mills 2001, Lynam et al. 2004, Purcell 2005), and coastal development (Richardson et al. 2009). Because many jellyfish have a complex life history that includes free-living sexual and asexual phases, populations can increase rapidly when environmental conditions change to favor them. Data pertaining to jellyfish abundance in Puget Sound are scarce, but information is growing (Rice 2007, Reum et al. 2010). Biomass estimates determined from surface-towed trawl surveys conducted at 52 sites in Puget Sound in 2003 revealed relative abundances of jellyfish as high as 80% to 90% of the total trawl biomass at multiple sites in both the South Sound and in the Main Basin (Rice 2007)(Figure 1). By contrast, the observed relative abundances in the more northern regions of the Whidbey Basin and Rosario Strait were generally much lower (Figure 1). Importantly, when basin-wide data were considered, Rice (2007) noted an apparent inverse relationship between fish and jellyfish biomass. 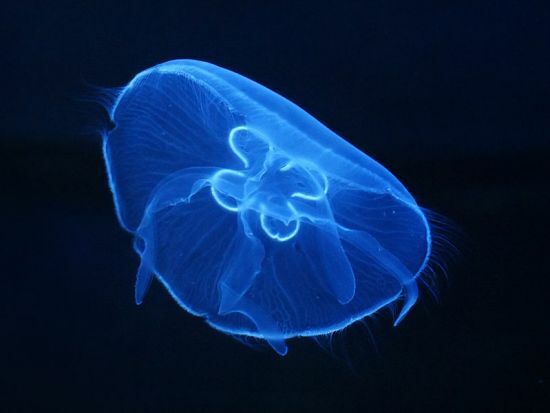 The jellyfish species observed were the Scyphomedusae Cyanea capillata, Phacellophora camschatica, Aurelia sp., the Hydromedusa Aequorea sp., and the Ctenophore Pleurobrachia bachei (Rice 2007). In June and September of 2007, Reum et al. (2010) conducted a more taxonomically-detailed study using bottom trawls in the northern and southern portions of Hood Canal (Hazel Point and Hoodsport, respectively) and in the Whidbey Basin (Useless Bay and Possession Sound). The species they reported were Phacellophora camtschatica, Cyanea capillata, Aurelia labiata and Aequorea victoria. While the abundances of jellyfish were both temporally and spatially variable, Reum et al. (2010) found that abundances were generally highest in June and at the southern portion of the Hood Canal mainstem near Hoodsport (Figure 2). Figure 1. Percentage fish (blue area) and jelly (yellow area) in the total biomass (black bars) for sites within each region. Each bar is the sum of the four monthly means from May to August for each site. Reprinted with permission from Rice (2007). Figure 2. Biomass and numerical abundance densities sampled in June and September at four locations in Puget Sound, WA. Note that the y-axis for biomass and numerical abundances are scaled differently between June and September to better visualize variation in species composition. Error bars indicate standard deviation. Reprinted with permission from Northwest Science (Reum et al. 2010). At this time it is not possible to determine temporal trends in jellyfish abundance in Puget Sound because existing data were collected using different methods and at different locations. The biology and ecology of most jellyfish are poorly known. In particular, knowledge of the asexually reproducing benthic polyp phase is limited (Boero et al. 2008). 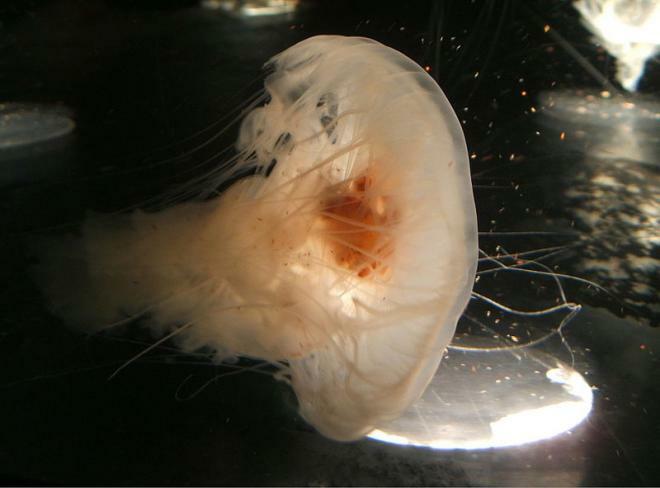 While it is clear from the limited available data that jellyfish are present in Puget Sound and that the likely causes of jellyfish outbursts (e.g., eutrophication, climate warming, coastal development and fishing pressure) also occur in Puget Sound to varying degrees, whether these factors are leading to increased jellyfish abundances has not been investigated. Because jellyfish have few predators, there is a high potential for them to disrupt food webs by displacing forage fish and other mid-trophic consumers, which could cause dramatic changes to the Puget Sound ecosystem. Indeed, a recent analysis of food webs in other temperate marine systems conducted by Samhouri et al. (2009) found that jellyfish were strongly correlated with multiple important ecosystem attributes, particularly those pertaining to trophic energy transfer. While the direct mechanisms responsible for increases in jellyfish abundance in other marine systems are still being elucidated (Mills 2001, Purcell et al. 2007, Boero et al. 2008, Richardson et al. 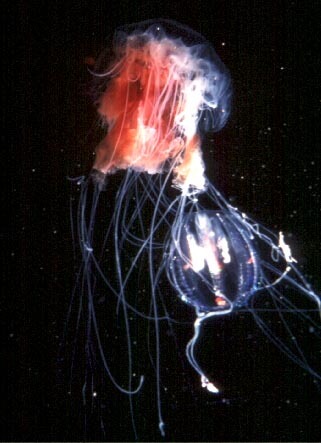 2009), there appear to be associations between anthropogenically-perturbed systems and increased jellyfish abundance. The existing data are not sufficient to assess temporal patterns of jellyfish abundance in Puget Sound. Improved monitoring of spatial and temporal variability in jellyfish abundance as well as variation likely abiotic drivers would help to elucidate the causes and potential consequences of changing jellyfish abundance. Arai, M. N. 2001. Pelagic coelenterates and eutrophication: a review. Hydrobiologia 451:69-87. Boero, F., J. Bouillon, C. Gravili, M. P. Miglietta, T. Parsons, and S. Piraino. 2008. Gelatinous plankton: irregularities rule the world (sometimes). Marine Ecology Progress Series 356:299-310. Brodeur, R. D., C. L. Suchman, D. C. Reese, T. W. Miller, and E. A. Daly. 2008. Spatial overlap and trophic interactions between pelagic fish and large jellyfish in the northern California Current. Marine Biology (Berlin) 154:649-659. Lynam, C. P., M. J. Gibbons, B. E. Axelsen, C. A. J. Sparks, J. Coetzee, B. G. Heywood, and A. S. Brierley. 2006. Jellyfish overtake fish in a heavily fished ecosystem. Current Biology 16:R492-R493. Lynam, C. P., S. J. Hay, and A. S. Brierley. 2004. Interannual variability in abundance of North Sea jellyfish and links to the North Atlantic Oscillation. Limnology and Oceanography 49:637-643. Mills, C. E. 2001. Jellyfish blooms: Are populations increasing globally in response to changing ocean conditions? Hydrobiologia:55-68. Pauly, D., W. Graham, S. Libralato, L. Morissette, and M. Deng Palomares. 2009. Jellyfish in ecosystems, online databases, and ecosystem models. Hydrobiologia 616:67-85. Purcell, J. E. 2005. Climate effects on formation of jellyfish and ctenophore blooms: a review. Journal of the Marine Biological Association of the UK 85:461-476. Purcell, J. E., and M. N. Arai. 2001. Interactions of pelagic cnidarians and ctenophores with fish: a review. Hydrobiologia 451:27-44. Purcell, J. E., S.-i. Uye, and W.-T. Lo. 2007. Anthropogenic causes of jellyfish blooms and their direct consequences for humans: a review. Marine Ecology Progress Series 350:153-174. Reum, J., M. Hunsicker, and C. Paulsen. 2010. Species composition and relative abundance of large medusae in Puget Sound, WA. Northwest Science.84(2):131-140. doi: 10.3955/046.084.0202 . Rice, C. A. 2007. Evaluating the biological condition of Puget Sound. Ph.D. dissertation. University of Washington, Aquatic and Fishery Sciences, Seattle, WA. Richardson, A. J., A. Bakun, G. C. Hays, and M. J. Gibbons. 2009. The jellyfish joyride: causes, consequences and management responses to a more gelatinous future. Trends in Ecology & Evolution 24:312-322. Ruzicka, J. J., R. D. Brodeur, and T. C. Wainwright. 2007. Seasonal food web models for the oregon inner-shelf ecosystem: Investigating the role of large jellyfish. California Cooperative Oceanic Fisheries Investigations Reports 48:106-128. Samhouri, J., P. Levin, and C. Harvey. 2009. Quantitative evaluation of marine ecosystem indicator performance using food web models. Ecosystems 12:1283-1298.